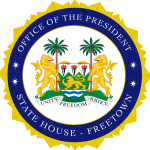 State House, Freetown, Thursday 7 June – His Excellency President Julius Maada Bio has told representatives of the Ahmadiyya Muslim Mission at State House that Sierra Leoneans should be proud of the high level of religious tolerance in the country. He said religious was a virtue Sierra Leoneans have nourished and must continue to preserve, adding that he was proud of the exemplary ways members of the Islamic and Christian faiths have conducted themselves in the course of pursing their work. He noted that had helped people maintain national peace and social cohesion in the country. “Religious tolerance is the pillar on which we stand as nation. It is a quality that we have been able to keep and this is something very difficult to maintain in other countries. We are proud of the leadership qualities displayed by both Christians and Muslims in their various missions and we must consolidate that unity,” he said. President Bio added that the Ahmadiyya Mission were a great part of the country and they had helped in the country’s development process. He thanked the mission for their contributions to Sierra Leonean, especially in the area of education. He noted that the mission had helped to develop many of his compatriots through education, many of whom had grown to be meaningful citizens in society. “We are very proud that the mission has been a constructive part to the development of Sierra Leone. The flagship project in my administration is education. This is because we cannot develop as a nation when the vast majority of our compatriots are uneducated. My free education programme is geared towards empowering every Sierra Leonean, especially the poor and we will work with all concerned parties to ensure that we achieve this dream,” he ended. On his part, the Amir and Missionary in Charge of the Ahmadiyya Muslim Mission, Saeed Urrahman, expressed excitement at the inspirational talk of the President. He said that they had a very rich history with Sierra Leone dating back to 1921 when the mission started in the country. He said ever since they had always supported to the country. The Ahmadiyya Amir also highlighted successes they had achieved in the country, especially in the education sector. He said the mission had established over 200 schools across the country to help train Sierra Leoneans into meaningful people in society. He commended President Bio for placing education on top of his priorities, stating that as a mission they were happy with his drive to depoliticise the education sector. He pledged their commitment to support President Bio’s education policies.